With Florida’s water supply continually subjected to contamination, now more than ever is the time to assure that your residence is in compliance with all the state and federal statutes, as fines and penalties are increasing due to the seriousness of our on-going water problems. All residential properties must comply by 2009. Many local authorities are requiring residential compliance at this time to insure compliance by the federal deadline. Our goal is to help keep your drinking water system clean, pure, and healthy to drink. 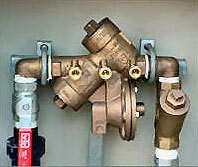 For your protection we have licensed and insured Backflow Technicians to service your needs. We not only test for record, we can evaluate your water system and inspect it for hazards.